Seveneves is a hard science fiction novel by Neal Stephenson published in 2015. The story tells of the desperate efforts to preserve Homo sapiens in the wake of apocalyptic events on Earth following the unexplained disintegration of the Moon, and the remaking of human society as a space-based civilization after a severe genetic bottleneck. At some unspecified date in the near future, an unknown agent causes the Moon to shatter into seven pieces. As the remnants of the Moon begin to collide with one another, astronomer and science popularizer "Doc" Dubois Harris calculates that the number of collisions will increase exponentially. A large number of Moon fragments will begin entering Earth's atmosphere, forming a "white sky" and blanketing the Earth within two years with what he calls a "Hard Rain" of bolides; this will cause the atmosphere to heat to incandescence and oceans to boil away, destroying the biosphere and rendering Earth uninhabitable for thousands of years. It is decided to evacuate as many people and resources as possible to a "Cloud Ark" in orbit, including a "swarm" of "arklet" habitats that will be able to avoid the debris from the Moon—both to attempt to preserve the human race and to give the remaining doomed inhabitants of Earth something to hope for, to prevent civil disorder from breaking out on Earth before its surface is destroyed. Each nation on Earth is invited to choose by lot a small number of young people to become eligible to join the Cloud Ark. The Cloud Ark is to be based around the International Space Station (ISS), currently commanded by American astronaut Ivy Xiao. The ISS is already bolted onto an iron Arjuna asteroid called Amalthea, which provides some protection against Moon debris. Robots are used to excavate Amalthea to provide more protection in a project run by mining and robotics engineer Dinah MacQuarie. Technicians and specialists, including Doc Dubois, are sent to the ISS in advance of the Hard Rain to prepare it to become the headquarters of the Cloud Ark. The plan is that the Cloud Ark must be self-sufficient for 5,000 years and capable of repopulating Earth once it is habitable again. A Human Genetic Archive is sent to the Cloud Ark, with the intention that it will be used to rebuild the human population. Approximately 1,500 people are launched into space in the two years before the Hard Rain begins. Suspecting that some architects of the Cloud Ark are interested only in pacifying Earth's inhabitants with false hope (rather than creating an environment that will actually survive in the long term), a billionaire named Sean Probst realizes that the Cloud Ark will need a ready supply of water in order to provide propellant for the space station and to prevent it from eventually falling into the Earth's atmosphere. He embarks on a two-year expedition to extract ice from a comet nicknamed Greg's Skeleton, using a nuclear reactor to provide power to bring it back towards Earth. The Hard Rain begins approximately two years after the destruction of the Moon as predicted; human civilization as well as nearly all life on Earth is obliterated, although some try to take shelter underground (such as Dinah's father) or in the deep ocean (such as Ivy's fiancé). Markus Leuker, appointed leader of the Cloud Ark, declares all nations of Earth to be dissolved, and imposes martial law under the Cloud Ark Constitution. Despite a worldwide agreement that members of government will not be launched into space, the President of the United States, Julia Bliss Flaherty, manages to get herself sent to the Cloud Ark at the last minute. Shortly afterwards the main cache of the physical Human Genetic Archive attached to the ISS is ruined by the thrusters of an arklet passing too closely, leaving only samples that had been distributed amongst the arks. There is disagreement on the Cloud Ark about the best way to organize its society and avoid the debris of the Moon. Some "Arkies" favor converting the Cloud Ark into a decentralized swarm of small space vessels at a higher orbit out of range of debris, rather than maintaining the central authority of the ISS. Doc Dubois wants to shelter in the "Cleft", a crevasse on the now-exposed iron core of the Moon. Others want to go to Mars. Julia Flaherty starts to acquire a coterie of followers and encourages the proponents of the decentralized swarm plan. Sean Probst's expedition has succeeded, and he has brought a comet into an orbit that will soon pass by Earth. His radio has failed and he has built a replacement by hand, and is able to communicate with Dinah MacQuarie by Morse code. However, he and his party die of radiation sickness caused by fallout from their nuclear reactor long before the expedition is complete. Markus Leuker and Dinah travel to the comet with a small crew to take control of it and bring it back to the Cloud Ark, in order to provide sufficient propellant to reach the Cleft on the moon's core. Just before Dinah returns with the ice as the sole survivor of the mission, Julia Flaherty persuades the majority of the population to abandon the ISS and move to higher orbit in a decentralized swarm, and sends a preliminary expedition to Mars. In the course of their sudden, unauthorized departure the ISS sustains catastrophic damage to many sections. The surviving portions of the Human Genetic Archive are carried along with them, but due to the Arkies' ignorance, these surviving portions are discarded or ignored. Only the digital version of the Human Genetic Archive survives aboard the ISS. The ISS and remaining third of the cloud ark combine through reshaping the ice into a support structure, and is rechristened Endurance. During the three years that it takes for Endurance to reach the Cleft, the majority of its population die of various causes (cancer caused by cosmic radiation, suicide, bolide strikes, etc. ); by the time they are within range of the Cleft, only about 30 survivors remain. Julia Bliss Flaherty's Swarm splits into two factions, who fight; Flaherty's faction is defeated. Running out of food, the Swarm resorts to cannibalism, and by the end of three years only 11 survive, including Flaherty and the leader of the opposing faction, Aïda. Aïda requests to reunite the remnant of the Swarm with the Cloud Ark before it reaches the Cleft, but secretly plans a battle for control of Endurance; as a result of that battle the population is diminished even further. By the time Endurance reaches the relative safety of the Cleft, there are only eight surviving Homo sapiens in space, all of whom are women. One, the sociologist Luisa, has reached menopause, and the remaining seven (Dinah, Ivy, Aïda, Tekla, Camila, Moira, and Julia) come to be known as the Seven Eves. The Human Genetic Archive has been destroyed, but they have sufficient resources to use the surviving genetics laboratory to rebuild the human race by parthenogenesis. They agree that each of the Seven Eves gets to choose how her offspring will be genetically modified or enhanced. Aïda predicts that, hundreds of years from now, this project shall result in seven new races. The narrative jumps to 5,000 years later. There are now three billion humans living in a ring around the Earth, and they have indeed formed into seven races, each one descended from and named after the Seven Eves who survived the events of Part 2. These races have quite distinct characteristics, including "Moirans" who can undergo "epigenetic shifts", radically changing their bodies in response to new environments. The iron core of the moon has mostly been used to build space habitats, but the Cleft itself has been turned into "Cradle", an exclusive piece of real estate attached to a tether that occasionally "docks" with Earth. Humanity has divided mostly along racial lines into two states, Red and Blue, which are engaged in a form of Cold War characterized by cultural isolation, espionage and border skirmishes, mediated by treaty agreements more honored in the breach than the observance. The orbiting races, the Spacers, terraform Earth by crashing ice comets into it to replenish the oceans, and seed the planet with genetically created organisms based upon re-sequenced DNA data saved from the escape to orbit. Once a breathable atmosphere is recreated, and sufficient plant and animal species have been reseeded, some members of the orbiting races ("Sooners") resettle the planet, in violation of treaty agreements. A "Seven", a group of seven people with one member from each race, is recruited by "Doc" Hu Noah, to investigate mysterious people who have been sighted on Earth. As the story unfolds, they discover that some humans did indeed survive the Hard Rain on the planet by living in deep mines ("Diggers"), while others survived in ocean trenches using submarines ("Pingers"). Although these survivors have also evolved socially and biologically to form two additional races, the survival of root stock humanity separate from the Seven Eves causes turmoil in Spacer high politics. Ground conflict eventually occurs because each of the orbiting camps (Red and Blue) wishes to establish a preferential or exclusive relationship with the Earthbound races: the Diggers, although descendants of Dinah's family, interpret the Blue state's presence on their territory as an act of aggression and develop an alliance with Red, prompting Blue to seek out an alliance with the Pingers on the strength of Ivy's connection with one of their founders. Matters are further complicated because the Diggers claim all of the Earth's land surface as their own, and initially hold the Spacers in disdain (despite their high technology) for having fled the planet eons ago. In an epilogue it is revealed that a separate, secret underwater ark had been created concurrently with the cloud ark, leading to the development of the Pingers, based on analysis of the "selfies" Ivy's fiance had sent her, using diagrams and sketches in the background as clues. Ty invites the surviving Seven (along with Sonar and Deep, representatives of the Diggers and the Pingers, respectively) back to apartments at his bar in the Cleft with the intent of forming the first "Nine". Dinah MacQuarie: Roboticist working for Arjuna expeditions (a private asteroid mining company). Her robots specialize in asteroid iron mining. She decides to focus her descendants' genetics on leadership and "heroic" qualities. Ivy Xiao: Born in Los Angeles, California, Xiao graduated from the United States Naval Academy before obtaining a PhD in applied physics from Princeton University. At the start of Seveneves, Xiao is the Commander of the International Space Station. She is demoted after allowing Sean Probst to utilize ISS resources, but becomes commander again after the death of her successor, Markus Leuker. Her descendants have attributes more focused on intelligence and academic study. Julia Bliss Flaherty: Frequently referred to as "JBF", Flaherty is President of the United States during the events of Part 1. In violation of an international accord, Flaherty saves herself by fleeing to the ISS aboard a Boeing X-37, along with Pete Starling, her science advisor. Flaherty attempts to re-assert her leadership and persuades a large number of cloud ark inhabitants to abandon the ISS. Disaster and internal dissent lead to her being replaced by Aïda Ferrari. Her descendants are more attuned to and adept at social and psychological manipulation. Moira Crewe: A geneticist sent aboard to ensure humanity's heterozygosity, Crewe was raised in London and obtained degrees from Oxford and Harvard, and had previously worked on the de-extinction of the woolly mammoth. Due to the loss of the physical Human Genetic Archive, Crewe's talents make her extremely valuable. Being the only person understanding the changes Aïda requests for her descendants, she responds, through seven failures, by giving her only surviving child the ability to undergo epigenetic shifts in order to counter all the changes Aïda makes in her offspring. Tekla Alekseyevna Ilushina: A Russian cosmonaut, Tekla was a former Olympic heptathlete, and was sent in the initial wave of suicide workers to retrofit the ISS for its role as the cloud ark hub. Rescued by Dinah when her suit life support system malfunctions, Tekla became the head of security aboard ISS. Her descendants have increased discipline and physical ability. Camila: Student and activist (implied to be from Afghanistan or Pakistan). Earlier in her life Camila survived an assassination attempt that necessitated extensive reconstructive surgery, and she was granted asylum in the Netherlands. Camila was chosen as an arkie as a rebuke to conservative Muslim countries that refused to nominate women in the Casting of Lots. While initially a close friend of former President Flaherty, Camila grows disillusioned with her during the events of the novel, ultimately preventing Flaherty from murdering Tekla. Camila has Moira imbue her descendants with non-aggressive traits, in order to be better suited to living in the close confines of space for generations. Aïda Ferrari: An Italian "Arkie", Aïda first appears after having led a revolt against Julia's control of the arklets that rebelled against the ISS. Deciding that future humans will look down upon her descendants due to the cannibalism she participated in while cut off from the ISS, she gives each of her children markedly different qualities, to best counter the attributes selected by the other Eves. Luisa Soter: A sociologist and the eighth surviving female of Endurance's journey to Cleft, Luisa is post-menopausal and thus incapable of becoming an "Eve". Luisa was born in New York City and educated at the Ethical Culture School, instilling in her a philosophy some of the Eves' descendants would carry. Luisa had previously worked with refugees and economic migrants, making her the first psychologist and social worker of the ISS population. "Doc" Dubois Jerome Xavier Harris, a.k.a. "Doob": Astronomer and television personality. Informs President Julia of the forthcoming Hard Rain, eventually sent up to the ISS as a leader and scientific advisor. On his urging pushes for the resettlement of the cloud ark on a canyon on "Cleft", a remnant of the moon's iron core which would protect them from radiation and meteorite strikes. Dies of multiple forms of cancer and metastases, probably obtained from radiation exposure, shortly after arrival on Cleft, content in the guaranteed safety to humanity provided by their new home. Tavistock Prowse: Blogger/Journalist and primary source of information for the arkies in the Cloud Ark. Sides with Julia and disseminates her propaganda advocating for secession from ISS. Initiates cannibalism among the arkies by eating his own leg due to their relative uselessness in space. Accidentally creates a religion amongst the secessionist arkies, with the swarm being viewed as a supernatural being. Is later eaten by Aïda and her followers shortly before their battle for Endurance to give them energy. The future human races view his siding with Julia and willingness to write her propaganda as caused by his reliance on distractive social media, and thus scorn advanced micro computing technologies intended for personal use. Sean Probst: Mining magnate and commander of comet-mining spacecraft Ymir. Launches an expedition to retrieve a comet after a political battle over aerospace resources. Successfully brings an ice comet into near Earth orbit but succumbs with the rest of his crew to radiation sickness from the fallout of the nuclear reactor they used. Cal Blankenship: U.S. Navy commander of a nuclear ballistic missile submarine. Nukes the Venezuelan navy and an army of protesters to protect rocket launches to the ISS after being ordered to do so by the president. He and Ivy amicably end their engagement during the Hard Rain, before he submerges to avoid the devastation. Revealed in the epilogue to have been part of an underwater ark project as extensive as the cloud ark, with his descendants recognizing the last photograph he had sent to Ivy upon Blue's first contact with the Pingers. Rufus MacQuarie: Dinah's father and operator of a mine in the Brooks Range in northern Alaska. Establishes a bunker with his friends, family, and associates to survive the Hard Rain, with his descendants becoming the Diggers. Of all the races, the Diggers remain closest to "root stock" humanity having simply enacted population control instead of using genetic engineering as the Spacers or selective breeding as the Pingers. Pete Starling: President Julia Bliss Flaherty's Science advisor. Oversees the development of the cloud ark, and attempts to seize the resources Sean Probst is acquiring for his asteroid mission. It is strongly hinted that he viewed the Cloud Ark as a panacea for maintaining social order in the face of extinction, and is unconcerned in the actual success of the project. Later killed by a micrometeorite within a space capsule after being launched into orbit in an X-37 at the last minute with the President. His gun is eventually displayed as a relic in a museum by the future human races, allowing visitors to see how different their armaments were from old Earth. Ulrika Ek: Swedish project manager of cloud ark construction. Launched to the cloud ark concurrently with Markus. Refused to provide separate religious worship pods, earning the ire of every religious group, and limited it to an interfaith pod. Dies from a stroke during the journey to cleft. Markus Leuker: A former Swiss Air Force pilot and ISS veteran, Markus was appointed commander of the cloud ark following Ivy's refusal to stop Sean Probst, and as a politically-neutral acceptable compromise. He quickly forms a sexual relationship with Dinah, and establishes a security force composed of wrestlers. Died when the MIV he is using to adjust the comet's course is damaged by accident. Rhys Aitken: A British engineer specializing in unusual constructs, initially sent to the ISS to integrate a torus for space tourists, Rhys inspires several upgrades and uses for Dinah's robots. He and Dinah have a brief sexual relationship which she breaks off due to his depressive moods following the conclusion of any of his projects. Assists in the creation of Endurance after which he slips into a depressive mood, eventually committing suicide a month into the journey. Vyacheslav Dubsky: Russian cosmonaut. Launched to the ISS alongside Rhys. Kath Amalthova Two: Moiran Surveyor for Blue. Takes the name Kath Amalthova Three after undergoing post traumatic epigenetic shift. Beled Tomov: Teklan Surveyor for Blue with an extensive military background. Teklans are the most physically capable of the seven races of humanity. "Doc" Hu Noah: Elderly Ivyn geneticist leading the expedition to the surface. Most prominent head of the new Earth terraforming project. Ivyns are most intelligent. Ariane Casablancova: Julian Quarantine agent. Julians are the most suspicious of the races, dominating intelligence and statecraft work. Secretly a mole for Red, successfully ensures the creation of a Red & Digger treaty. Remembrance aka "Memmie": Camite; and Hu's aide/nurse. Camites tend to be non-confrontational and compassionate. Is killed on first contact with the Diggers. Tyuratam "Ty" Lake: Dinan bartender/manager, Indigen (aka Sooner), and military veteran. Dinans are natural leaders. Is employed by a secretive society serving the "Purpose", and recruited by Doc for his seven. Langobard: Aïdan Neoander and Indigen. Neoanders are one of the seven subraces of Aïdans, most of which were initially designed to counter the strengths of the other races. As physically capable and intelligent as any Teklan despite not needing to exercise. Their DNA was sequenced with remnants of [Neanderthal] DNA from Aïda and a preserved Neanderthalian toe. Einstein: Ivyn Indigen. Indigens are those who colonized the surface as soon as it was habitable, going against treaties in place at the time. Discovered a buried truck from Old Earth, his efforts to show it to the seven lead to first contact with the Diggers who highly value the truck's metal. Sonar Taxlaw: Digger encyclopedist. Diggers are the descendants of those who survived the Hard Rain in underground shelters. Specialist on the "S" section of the encyclopedia, joins the seven after first contact, fleeing with them from her repressive society and explaining how to contact the Pingers. Deep: Pinger envoy. Pingers are the descendants of those who survived the Hard Rain in underwater caverns aboard submarines. Initially selectively breeding for confined spaces, they started selectively breeding to survive underwater after the "spacers" had restored water through the crashing of comets. Stephenson first began planning his novel around 2006, while he was working at Blue Origin. He observed: "Some researchers had begun to express concern over the possibility that a collision between two pieces of debris might spawn a large number of fragments, thereby increasing the probability of further collisions and further fragments, producing a chain reaction that might put so much debris into low Earth orbit as to create a barrier to future space exploration. Having been raised on the idea of 'Space, the Final Frontier', I was both appalled and fascinated by the possibility that it might instead become an impenetrable ceiling only a hundred or so miles above our heads." Such a collisional domino effect of satellite destruction is known as the Kessler syndrome. He would continue to develop Seveneves over the next eight years, as Stephenson tried to "stick to legit science as much as I can". As of June 2015[update], critical reception for Seveneves has been mostly positive. A review in the Chicago Tribune commented on the book's length, stating "when Stephenson finds a theme commensurate with his ambition, all those pages can speed by like a bullet train. Seveneves offers at once his most conventional science-fiction scenario and a superb exploration of his abiding fascination with systems, philosophies and the limits of technology." Booklist also praised the work, writing "Well-paced over three parts covering 5,000 years of humanity's future, Stephenson's monster of a book is likely to dominate your 2015 sf-reading experience." Molecular biologist Jennifer Doudna praised the book as a "fantastic adventure across time and space, grounded in science but deeply thought-provoking about human nature and the future of our species". Bill Gates recommended Seveneves as one of five books to read in the summer of 2016, praising in particular its scientific accuracy. He writes, "Seveneves reminded me of all the things I love about science fiction". The Guardian's Steven Poole was more critical in his review, criticizing the work as being overly descriptive, and observing: "Once we arrive in the novel's snail-paced last third, there are lots and lots of lavish descriptions of imaginary machines: city-sized orbiting habitats, giant pendulums reaching down into the Earth's atmosphere, 'sky trains'. After scores of pages of this, my eyelids were succumbing to a powerful gravitational force." The Initiative for Interstellar Studies published a review in their quarterly online magazine focusing on the book’s use of orbital dynamics as one of the main technology themes forming the backdrop of the book. The book was shortlisted for the 2016 Hugo Award for Best Novel. The book also received the libertarian Prometheus Award of 2016. In 2016 Skydance Media hired screenwriter William Broyles Jr., director Ron Howard, and producer Brian Grazer to adapt the feature film. ^ "Seveneves: A Novel by Neal Stephenson". Harper Collins. Retrieved 2015-05-11. ^ Alexander, Niall. "Seveneves of Neal Stephenson". Tor.com. Retrieved 17 May 2015. ^ Higgins, Jim. "Neal Stephenson talks about his new book, Seveneves, and real science". Journal Sentinel. Retrieved 17 May 2015. ^ Neal, Stepheson. "Writer" (Video). The Seveneves Notebook. Neal Stephenson. Retrieved 6 June 2015. ^ "Seveneves (review)". Library Journal. Retrieved 17 May 2015. ^ "Seveneves (review)". Publishers Weekly. Retrieved 17 May 2015. ^ "Seveneves (review)". Kirkus Reviews. Retrieved 17 May 2015. ^ Wolfe, Gary K. (May 14, 2015). 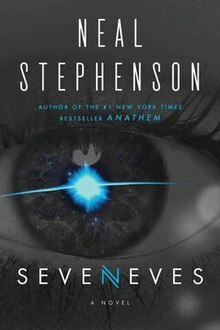 "Review: Seveneves by Neal Stephenson". Chicago Tribune. Retrieved 17 May 2015. ^ Francis, Chris. "Seveneves (review)". Booklist. Retrieved 17 May 2015. ^ Poole, Steven. "Seveneves by Neal Stephenson – a truly epic disaster novel". The Guardian. Retrieved 17 May 2015. ^ "The Orbits of Seveneves" (PDF). PRINCIPIUM - Issue 20 (February 2018), p. 16–18. The Initiative for Interstellar Studies. Retrieved 17 December 2018. ^ Jr, Mike Fleming (June 8, 2016). "Skydance Reunites 'Apollo 13' Team For Neal Stephenson Sci-Fi Novel 'Seveneves'". Deadline. Retrieved June 9, 2016.